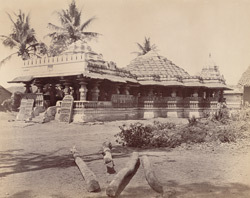 Photograph of the Tarakeshvara Temple at Hangal from the north-east, taken by Henry Cousens in the 1880s. The temple is built in the Hoysala style and consists of a sanctuary with a great adjoining pillared hall and a Nandi pavilion resting on 12 pillars incorporating leaning balcony seating. The columns are lathe-turned or have geometric shapes. Both halls have stepped pyramidal roofs. The outer walls are decorated with carvings of miniature temples. In front of the great hall there are three memorial stones carved with religious and military scenes. The 'lotus of Hangal' stands in one corner of the temple. This is a large, octagonal piece of stone which is supported on eight pillars. The rock is carved in the form of a lotus and is thirty feet in diameter. It is difficult to understand how this got to the precarious position it now takes up.